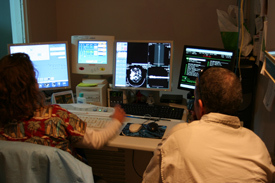 Lower Keys Medical Center Performs CAT Scans! An interesting part of the archaeological process that most people may not be aware of is the trip to the hospital that they sometimes take. 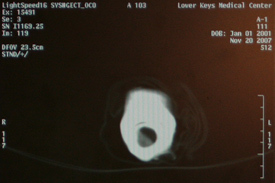 That’s right, last week 13 artifacts from Mel Fisher’s Treasures’ conservation lab took a trip to the Lower Keys Medical Center to undergo CAT Scans. Why? Because sometimes it is critical to know where exactly the artifact is inside of the concretion and how much of the metal is actually left, if any at all. As you may recall in a previous article we talked about how the encrustation could be used as a mold if the artifact itself had completely eroded over the years. 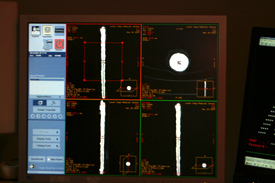 By performing a CAT Scan on the encrusted object (mainly swords, arquebus and other unique items) the conservationist is able to know where the metal is inside the encrusted object and can then figure the best way to approach conservation of these very delicate artifacts without destroying any portion of the metal. Our Senior Conservator, John, was on call for 3 days with Mechelle Buffington, a CAT Scan technician at the Lower Keys Medical Center. When she finally had a lull between patients John brought 13 artifacts including arquebus, sword handles and daggers to the medical center. 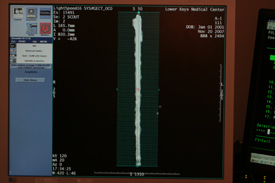 The swords and arquebus CAT Scan images were captured separately and the daggers were scanned in a group. 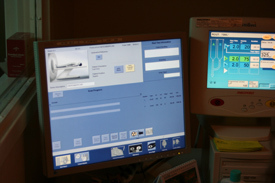 The whole process took 2 hours because after the scans were taken John, with Mechelle’s help, was able to study the images on the computer screen and decide how to adjust the resolution of the image to fit his purposes. After he was satisfied with the images on the computer screen they were printed out into film medium so he would be able to bring them back to the conservation lab with him. While he is working on each artifact the film will be backlit immediately in front of the artifact he is working on so he knows exactly which area of the artifact he is dealing with and can properly conserve the item. From what John can tell so far the arquebuses looked great, the muzzle end may be a bit eroded. Early views of the films show that there are parts missing on the sword handles and the daggers are still being studied. The handles look to be in good condition but we are unable to draw any conclusions about the blades as of yet. John would like to extend his appreciation to Mechelle and the Lower Keys Medical Center for being so accommodating and kind throughout the whole process.